Why choose our Hyperbaric Chamber? The benefits of increasing body oxygen levels. The brain – which is only two percent of our total weight – uses more than twenty percent of the body’s oxygen. Only ten percent of our energy comes from the food we eat, while the remaining ninety percent comes from oxygen. Blood is made up of three main components; white blood cells that fight infection, red blood cells that carry oxygen and plasma, the fluid that carries both kinds of cells throughout the body. Under normal circumstances, the red cells carry the majority of oxygen while the plasma carries about 3% of oxygen. Since Hyperbaric oxygen therapy forces oxygen into the body fluids under pressure, more oxygen is dissolved into the plasma greatly increasing the oxygen levels. The fluids then carry the extra oxygen throughout the body to enhance the body’s natural healing process. How much more oxygen will be available as a result of hyperbaric therapy? We actually only use between 4 and 6% of the oxygen we breathe. During treatment around 24 – 30% oxygen is available to us. In effect, under pressure the body can absorb almost ten times more oxygen than normal. Hyperbaric Therapy Improves Healing and Function Increased oxygen levels in the blood plasma gives the body tissues the ability to become more concentrated with oxygen creating a more effective environment to support normal healing and cell function. In addition to helping patients heal post-surgery and athletes recover from injuries and fatigue, Hyperbaric Therapy can provide effective treatment for some medical conditions. It helps to reduce hypoxic areas (insufficient oxygen for function) of the body to improve metabolic function of cells, support and strengthen immune response and enhance normal healing processes. Treatment protocol is dependent on individual cases and histories. Most treatment requires an initial concentration period and then further assessment and prescription relevant to the initial response to Hyperbaric Therapy and other modalities. Hyperbaric oxygen therapy boosts immune response and enhances performance levels. As we all know training is tough on the body, if you want to succeed you have to push yourself. But your body also needs time to recover. Oxygen therapy helps your body to recover faster by reducing inflammation and accelerating muscle repair. So you can push yourself further than you thought possible with more rigorous training schedules and better results. Have you ever wondered why a muscle tear (strain) heals quicker than a ligament tear (sprain)? The answer… Oxygen! Muscles have an abundant supply of oxygen providing them with the necessary energy needed for increased protein synthesis during tissue repair and regeneration. Ligaments and tendons on the other hand, do not. So, the question remains how do we get more oxygen to the tissues? The answer is simple…Pressure! The elevated oxygen levels allows athletes to increase performance and recover more rapidly. Why will I need Hyperbaric Oxygen Therapy? Oxygen is carried to the cells where it is the vital ingredient in the healing process. 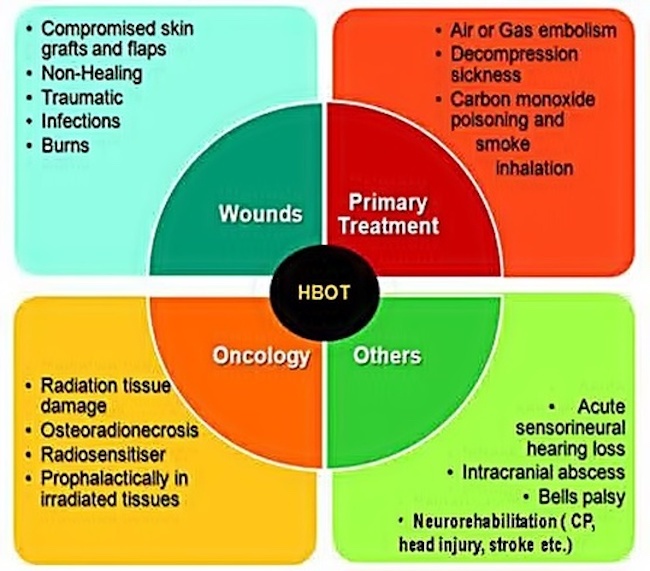 Hyperbaric Oxygen Therapy before and after surgery helps to heal wounds and accelerates recovery. Here are the answers to some of the most frequently asked questions . . .
How will I feel during and after the treatment? Generally, hyperbaric oxygen therapy is a relaxing experience – in fact most people drift off to sleep. Your body will be detoxing and this is normal. However, some people may experience minor symptoms associated with detoxing after the treatment. Following your first few sessions, you may experience fatigue as the body sweeps itself clear of toxic debris that has built up in the body. This is safe and normal during the healing process. Alternatively, you may feel more alert, awake and energised with no detox symptoms – it will depend on your own body. What does it feel like in the chamber? You may feel a change of pressure in your ears, similar to the sensation of descending in an aircraft or diving deep in a pool. During treatment you may feel slightly warm whilst the chamber is pressuring, comfortable when the chamber is at pressure and slightly cool as it depressurises. Your heart rate and blood pressure will settle as the pressure increases helping you to relax. Is Mild Hyperbaric Therapy Safe? Yes, it is safe for every body – from the very young to the elderly. There have been no known side effects reported for Mild Hyperbaric Therapy. Not at all, it is completely comfortable and safe. Mild Hyperbaric Oxygen Therapy has many healing and therapeutic benefits. The chamber can be utilised without the danger of oxygen toxicity. And as it is completely safe, can be combined with most other therapies without the side effects associated with some treatments. Sessions usually last an hour, however you can use the chamber for much longer without any adverse effects. After each session you can carry on with your day as normal – there are no restrictions. You will be fully clothed during treatment and it is important that you relax, so wear something loose and comfortable. Will I feel restricted in the chamber? Not at all. Our state of the art chambers are spacious and comfortable and provide healing oxygen therapy in the most comfortable environment possible. The increased level of oxygen promotes a deep sense of relaxation. One hour in this oxygen rich environment is equivalent to four hours of quality sleep. What can I use in the chamber? Whilst in the chamber, you can listen to your favourite music, meditate, read a book, use your mobile phone or laptop or simply relax…and breathe in the benefits. It is difficult to know how many sessions will be needed to heal an injury or manage an illness as this may depend on the extent of the injury or the time a chronic disease has been present. Daily sessions will enable the body to gain a threefold increase in the rate of healing. Your therapist will discuss your lifestyle and health goals before any treatment is commenced. After treatment, occasional oxygen therapy treatments are recommended to ensure that oxygen levels remain optimum.